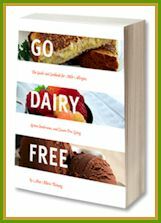 A few weeks ago I received an email from a Cooking Light rep about checking out their September issue, which was the first month to sport their “new look.” As you may have read prior, I broke down earlier this year and indulged in a subscription (read my note at the end before you think about doing it yourself! ), so she didn’t need to send me a copy, mine was already on its way. The “look” is really 1980’s if you ask my husband and I. They have gone out with the solid-colored backgrounds, and brought in white pages with red writing and what looks to be bigger fonts (possibly good, but does this mean less content?). It does make the food photos pop more, but gives the mag a cheaper look in my opinion. Also, the pages seem “busier,” which bugs my eyes a bit. Of course, these factors don’t affect the content, so I am sure I will get used to it! The only content complaint I have is the new flow of the magazine. I actually really, really liked how the first half of the magazine focused on health living stories and tidbits, while the second half focused on the actual recipes and cooking. I always enjoyed reading the substance first and then feeling rewarded for my attention with the abundant food photography and recipes after. Plus, it made it easy for me to go back and find a story even if I couldn’t remember the name. The new format jumbles everything altogether, a story here, a recipe there. It will take me a little time to get used to the new flow I think. At least one photo with every recipe. Need I say more? Well, you really can’t shut me up so … I am not sure if this means less recipes overall, but thus far, I haven’t felt slighted. I wasn’t someone who was yearning for all of those photos, but who am I to complain about additional eye candy? They seem to be keeping up with the times. There has been a huge shift in the magazine’s focus (at least from what I noticed) to fast and frugal. Words like “easy” abound, with a feel for more simple home cooking and money-saving tips. Substitute 3 tablespoons of creamy or chunky peanut butter for 1 egg as a binder for meatballs with an Asian flavor profile. ~ you can bet I will be trialing this idea! Use 1 to 2 tablespoons natural or chunky peanut butter to add body to a brothy soup. ~ I actually love this technique in African Peanut Soup, but could see some more potential. Stir 1 tablespoon creamy peanut butter into a broth-based pan sauce for pork or chicken in place of the dairy butter to finish the sauce and add richness. ~ The husband isn’t a fan of PB with meat, but I have used other nut butters this way (cashew, brazil nut, and pine nut) and it is awesome! Alisa’s #4: Stir 1 to 2 tablespoons of nut butter into a tomato rich soup or sauce to cut the acidity of the tomatoes a bit and mellow the flavor. I did this just this week with a tomato basil soup, and it really did cut the acidity and added to the overal flavor/texture. Now, if I can find my dang notes, I will post the recipe! Do you have any other ideas for using PB or nut butters? Have you seen the new Cooking Light look? If so, what do you think? There is a feature in the October 2009 issue of Cooking Light (on newsstands now) called “How to Build a Better Noodle Bowl.” Oh my goodness, if you love all types of noodle dishes (from Japan, China, Malaysia, Italy, Singapore, Spain, and Thailand) then you must check this article out! I am hoping to trial every single one of the noodle bowl recipes. Since discovering that the recipe indexes and all of the recipes for the issues are now posted online, I won’t be wasting the paper on print issues in the future. I had no idea! So to help save some trees, I suggest you check out the Cooking Light Current Issue page online, before deciding that you need the full thing in print. A handy new feature for us E-recipe junkies. The new layout reminds me of Martha Stewart’s FOOD magazine. One of the things I always liked about Cooking Light was the complexity of the recipes. I hope they don’t simplify too much. I’m sure they get a lot of readers asking for quick and easy recipes. It’s too bad…food is important and worth spending some time on! I just use PB in my asian crockpot pork for a peanut sauce. Yum! Also, I’m not sure this is a “tip” but I love schmearing PB on a warm slice of banana bread. It gets all melty and gooey and is so much better than butter on there! I subscribe to Cooking Light and honestly I didn’t even notice they had a new look, but I do remember reading the peanut butter article. Maybe it’s because I subscribe to so many magazines or maybe I was just tired. Either way, I love this magazine. 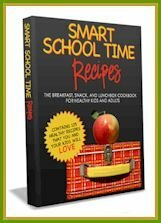 It’s a great way to get ideas about great food with healthier elements. Thanks for the great PB tips, especially the great Vegan PB ice cream recipe. I shall certainly try nut butter the next time I make home made tomato soup as I usually use raw brown sugar to take the acidity out of it 3which isn’t ideal. I never buy cooking mags any more as I get so many fabulous cooking newsletters emailed to me and there is so much info on websites and blogs there isn’t a need for me to do so anymore. You are right about the 80’s. 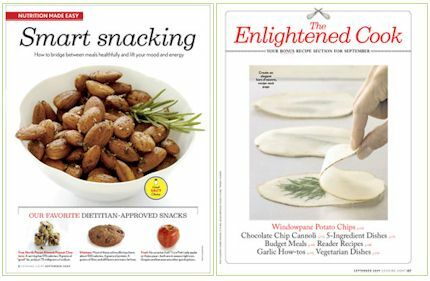 The layout of Cooking Light mag reminds me of the series of mags that I used then where you got a free binder every time you collected 20 copies of the mag. Oh, I am all about noodle bowls!!! I can’t believe it, I think I let my subscription run out last month! I can always count on you for great reviews. Cooking light has been one of the magazines that I visit while at Barnes and Nobel every month. hahahah I just need to take the leap of faith and subscribe!! OH PLEASE do try all the noodles in the magazine. I am a noodle whore so i’d love to know which ones are going down in your recipe book! !